Old Harrisburg Historical Marker. Image available on the Internet and included in accordance with Title 17 U.S.C. Section 107. 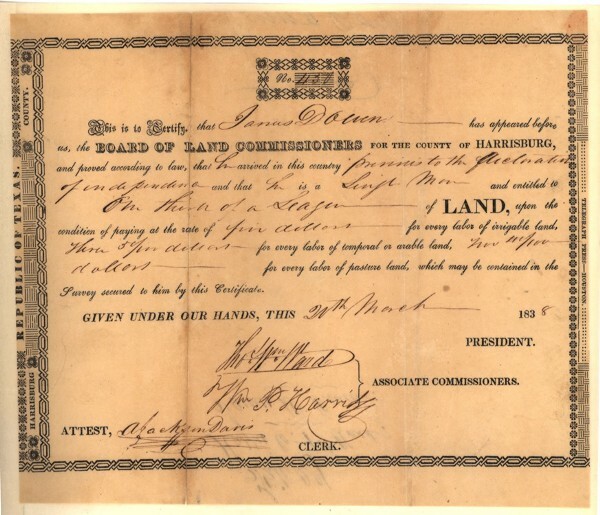 Harrisburg Land Transfer Document. Image available on the Internet and included in accordance with Title 17 U.S.C. Section 107. Harrisburg Town Stock. Courtesy of Southern Methodist University. Image available on the Internet and included in accordance with Title 17 U.S.C. Section 107. Harris County Historical Map. Image available on the Internet and included in accordance with Title 17 U.S.C. Section 107. Houston Ship Channel, 1946. Courtesy of the University of Houston. Image available on the Internet and included in accordance with Title 17 U.S.C. Section 107. HARRISBURG, TEXAS (Harris County). Harrisburg (Harrisburgh), on the right bank of Buffalo Bayou in eastern Harris County, was established before 1825 on the survey of New York entrepreneur John Richardson Harris. In 1826 Francis W. Johnson surveyed the town, and Harris formally named it Harrisburg, in honor, no doubt, of himself, as well as of Harrisburg, Pennsylvania, which had been founded by and named for his great-grandfather. A small sawmill cut local timber, and ships plied between Harrisburg and ports in the United States and Mexico. Freight for San Felipe de Austin went by water to Harrisburg and then moved overland to the Brazos River. On December 30, 1835, the General Council established Harrisburg Municipality and designated the town the seat of its government. Edward Wray, alcalde, and H. H. League and Nathaniel Lynch, judges, transacted municipal business in Harrisburg until April 16, 1836, when Antonio López de Santa Anna burned the entire town except the residence of John W. Moore. Shortly after the Texas Revolution the city of Houston was laid out on the bayou above Harrisburg and became the seat of Harrisburg (later Harris) County and the capital of the Republic of Texas. 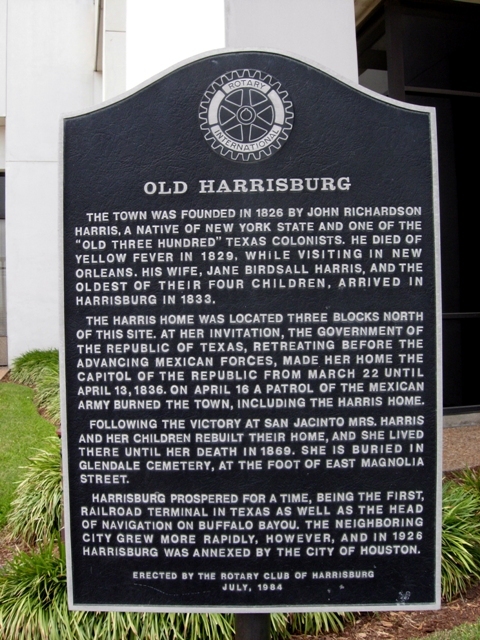 Harrisburg recovered from Santa Anna's incendiarism and was incorporated on June 5, 1837. On June 23, 1839, the town was consolidated with Hamilton, on the opposite bank of the bayou, under a trust of Boston investors known as the Harrisburg Town Company. The population was about 1,400. The company functioned until 1849, first under the agency of Andrew Briscoe and later under that of DeWitt Clinton Harris. During that time a new plat was made by Frederick Jacob Rothhaas, the Harrisburg Railroad and Trading Company was chartered, and citizens offered the town to the republic as capital. The Buffalo Bayou, Brazos and Colorado Railway Company purchased the town property in 1847 for $150,000. A Harrisburgh post office, established in 1853, shortened its name to Harrisburg in 1892 and operated until 1927, when mail was rerouted through Houston. By 1853 Harrisburg had a steam saw and grist mill, several stores, three hotels, and a railroad terminal with shops and yards. With the construction of the road to Alleyton and the establishment of steamship connections with Galveston, Harrisburg became the first railroad terminal in Texas. After the Civil War the railroad became the Galveston, Harrisburg and San Antonio and extended its track to San Antonio. Harrisburg remained important until the railroad shops were destroyed by fire and rebuilt in Houston during the 1870s. By 1890 the town's population had fallen to 431. In 1905 the local white school had ninety-two pupils and two teachers, and the local black school had 123 students and two teachers. Widening of the Houston Ship Channel brought industry after 1919, but some residents left as a result. In December 1926 Harrisburg, with a population of about 1,460, was formally annexed to Houston. By 1955 the community was part of the East End, a vaguely defined area bordered by the ship channel, Bray's Bayou, the railroad, and La Porte Road. The name Harrisburg is still attached to the vicinity, but Glendale Cemetery and a state historical marker alone remain at the former townsite. Edwin Rice Brown and Leslie L. Walker, Jr., Harrisburg: The Community and Its Rotary Club (Houston, 1955). James Burke, Jr., Burke's Texas Almanac and Immigrant's Handbook for 1879 (Houston, 1879; facsimile, Austin: Steck-Warlick, 1969). Houston Metropolitan Research Center Files, Houston Public Library. Adele B. Looscan, "The Pioneer Harrises of Harris County," Southwestern Historical Quarterly 31 (April 1928). David G. McComb, Houston: The Bayou City (Austin: University of Texas Press, 1969; rev. ed., Houston: A History, 1981). Andrew Forest Muir, "The Destiny of Buffalo Bayou," Southwestern Historical Quarterly 47 (October 1943). Andrew Forest Muir, "The Municipality of Harrisburg, 1835–1836," Southwestern Historical Quarterly 56 (July 1952). Andrew Forest Muir, "Railroad Enterprise in Texas, 1836–1841," Southwestern Historical Quarterly 47 (April 1944). Vertical Files, Dolph Briscoe Center for American History, University of Texas at Austin. Handbook of Texas Online, Andrew Forest Muir, "HARRISBURG, TX (HARRIS COUNTY)," accessed April 24, 2019, http://www.tshaonline.org/handbook/online/articles/hvh27.